When he was a little kid, Frank L. Hammond III would watch the Transformers animated series or, if that wasn’t on, he’d watch Challenge of the GoBots. While both programs were created to help toy companies sell toys (Transformers and GoBots), they managed to do something else for Hammond. They nurtured his budding interest in robots. “Ever since I was a kid I’ve been into robotics, and these shows featured robots that could change their form, which I thought was very cool,” says Hammond, assistant professor in the Wallace H. Coulter Department of Biomedical Engineering and the George W. Woodruff School of Mechanical Engineering. “So I’ve always been interested in devices like these, that could change their form or function to fit the needs of the environment,” adds Hammond, who recently joined the multidisciplinary team of researchers at the Petit Institute for Bioengineering and Bioscience. The overarching goal of his research is right there in the name of the lab he helms: the Adaptive Robotic Manipulation Lab. So Hammond shows off a hand-like device with two fingers and a thumb, soft to the touch, like skin – silicone digits formed in a 3D printed mold, actuated through pneumatic means via little CO2 cartridges. The replacement hand can grasp a coffee cup or a bottle of water, open a door, and what it may lack in precision (at this point), it makes up for in utility and cost. One of these devices costs less than $100 to make. Hammond demonstrates the hand and its pneumatic actuator. It’s a self-attaching device – you can attach it using one able arm. He lowers air pressure or changes the air distribution to control how the fingers bend and move. And though Hammond isn’t saying his robotic hand is a full-on replacement for your real hand, it does offer the user some options that Mother Nature can’t. 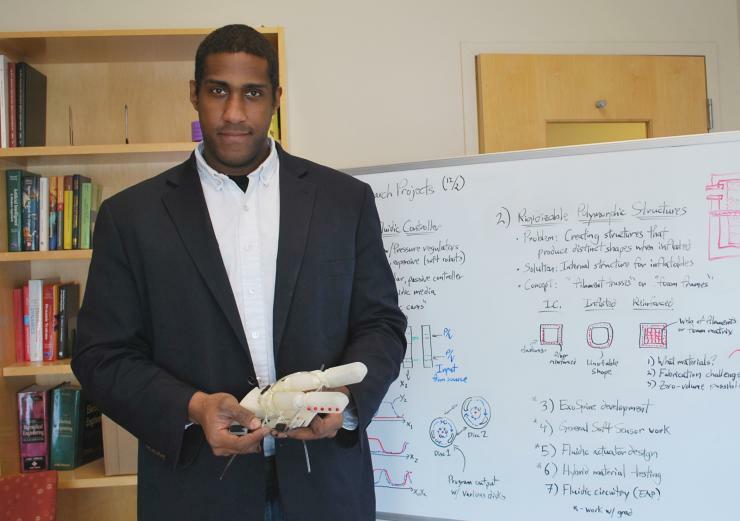 Hammond earned his Ph.D. at Carnegie Mellon, where he worked and studied in the department of mechanical engineering and The Robotics Institute. He did his postdoctoral work at Harvard and the Massachusetts Institute of Technology (MIT), where leading researchers are directing a number of projects aimed at giving humans extra capability. Robotics researchers have coined a phrase, “supernumerary robotics.” Imagine having extra limbs (supernumerary robotic limbs, or SLRs), which are not designed to replace a missing limb, but to augment what you have. “They’re still using rigid linkages and electric motors for most of the work, because these are very well known components, easy to characterize and control,” says Hammond, who arrived at Georgia Tech in time for last fall semester.